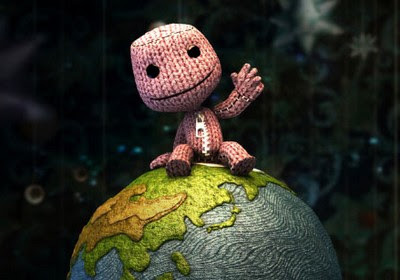 Over the weekend I finally managed to finish LittleBigPlanet. I know, I know, it's shocking that I took so long, isn't it? What can I say? There is no excuse for it, regardless of whether I try to hide behind one or not. It is irrelevant now as I have finished it, loved it and look forward to redefining what the game is by experimenting with its other assets. A few months ago I watched my girlfriend play many of the game's levels as well as some created by the community. I even watched her start creating her own. She's still working on it, but in the meantime I was able to play the single player campaign myself and see everything that developer Media Molecule created for the game. Unfortunately for me, my thoughts have hardly changed and seeing her play it has definitely influenced my opinion, so nothing has really changed. I still came away from it impressed by what MM were able to achieve, and I'm happy that I was able to play such a different, unique and yet familiar game. One of the things that stands out from my time with LittleBigPlanet is the multicultural themes that exist within the game's levels and their themes, as well as the art direction of the overall product. It was, in a word, charming and completely different from anything else I have played in quite some time. So with the game finished, what is left? Well, the user created levels of course. I've already played some but would still like to take the time to try a few more. After that, I will be trying to create my own level and I look forward to experimenting with the editor to see if I can make anything that may be remotely decent. I would also like to play the game in co-op, something I've been unable to do due to the lack of a second controller and the fact that every time I have tried to play it online, I have never been successful. The completionist in me also wants to try the co-op as there are still stickers, items and so on that can only be collected in those sections of the levels. So basically, there are still plenty of things for me to do in the game and as such I intend on playing it for many more months to come. I also intend to discuss some things in particular on the blog, such as the game's multicultural side I mentioned above. Stay tuned, then.